Jean Pearson, newly elected chairman of u3a Todmorden started her term of office by opening a busy exhibition day at Central Methodist Church. Jean Pearson, newly elected chairman of u3a Todmorden, following the untimely death of David Cross, started her term of office by opening a busy exhibition day at Central Methodist Church. Jean said she was delighted by the attendance, not only of members but also the public . Over 100 people saw displays by 21 of the 23 specialist groups : art appreciation, practical art, crafts, philosophy, social history, let’s go, coffee club, ramblers, world affairs, science, natural history, photography, lunch club, spanish conversation, poetry appreciation, art club, creative writing, quiz and scrabble groups, table tennis and badminton and the concert party. Jean said it was difficult for her to visit all the stands because of the throng of people: but she was not complaining ! 16 new members joined, on the day and many groups confirmed that they had also experienced great interest. 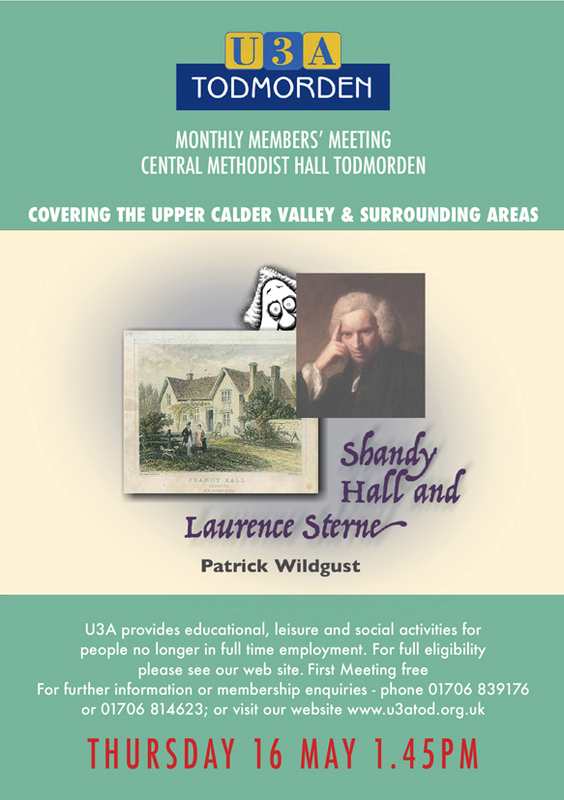 membership now totals 325, perhaps making u3a Todmorden one of the largest organisations in the Upper Calder Valley. The monthly members meeting followed the event and was attended by 132 members and visitors.